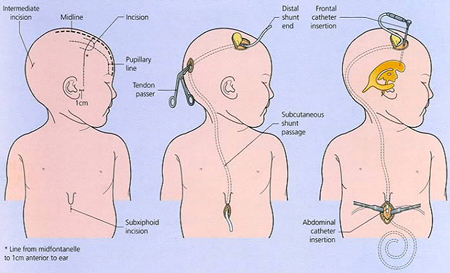 The most common treatment for hydrocephalus is the surgical insertion of a drainage system, called a Shunt. This system diverts the flow of CSF from the CNS to another area of the body where it can be absorbed as part of the normal circulatory process. In most cases, the fluid is diverted to the peritoneal cavity in the abdomen or one of the chambers of the heart. A shunt is usually composed of three parts: a silicone catheter that enters the enlarged ventricle; a one-way valve that only allows flow away from the ventricle; and tubing which enters the cavity that is to receive the fluid. Each valve is designed to operate at a set pressure, so that a high-pressure valve will allow less fluid to flow through it than a low-pressure valve. A variety of valve designs are available and efforts are constantly underway to improve them. The entire shunt system is placed underneath the skin. People who have hydrocephalus usually need a shunt system for the rest of their lives, so additional surgeries may be needed to insert longer tubing to match a child's growth. Revisions to the shunt also may be needed if the tubing becomes blocked or infected.